The 230V Thermostat has an adjustable Night Setback (NSB) feature from 2oC to 7oC (factory pre set 4.5oC). 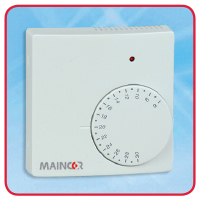 The temperature range can be limited, stopping accidental movement and includes terminals to add an optional remote sensor. 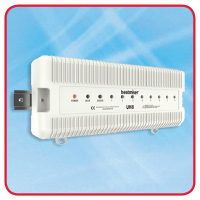 The thermostat requires a 4 core plus earth cable if the NSB feature is to be utilised or 3 core plus earth if not. The Single Channel Time Clock is used to switch the UFH system on/off, or to operate night setback. (note, for use with SBSTAT-02 – see above). 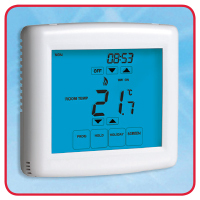 The 230V Programmable Thermostat can work in 3 modes; to control the air temperature only, to control the air temperature and limit the floor temperature, or to only control the floor temperature. A floor sensor is included with each programmable thermostat and a 3 core plus earth cable is required. 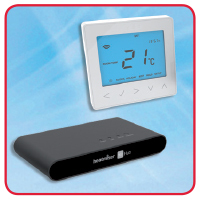 The 230V Touchscreen Programmable Thermostat offers control over the air temperature of the room where its situated, or remote sensing if the additional sensor is purchased. The thermostat requires a 3 core plus earth cable. The Neohub should be plugged into a wireless router and this allows for the system to be controlled via Smart Phones or Tablets. 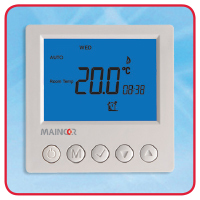 The 230V Wiring Centre has terminals to wire up to 8 thermostats (zones). The unit controls the operation of the Electro-Thermic Heads, the boiler and the Zone Valve. The unit is for use with all controls listed on the previous page.